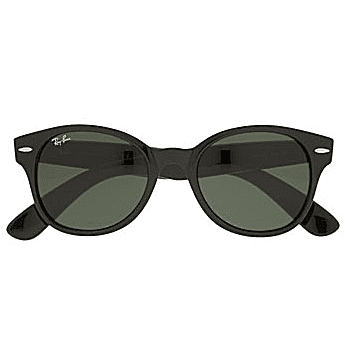 Originally created by Ray-Ban, a high end manufacturer of sunglasses, Wayfarer sunglasses were extremely popular in the '50s and '60s. They were popularized once again in the '80s, and have made yet another comeback in modern day fashion. Wayfarers have been cited as the most popular selling sunglasses in history, although some believe this honor is held by the classic aviator style. Either way, wayfarer sunglasses are incredibly popular. Wayfarers were created by optical designer Raymond Stegeman in 1952 when he procured dozens of patents for Baush and Lomb, Ray-Ban's parent company at the time. At the time of their inception, the wayfarer was seen as a radical design that rivaled the Cadillac's tail fin and design critic Stephen Bayley, the "distinctive trapezoidal frame spoke a non-verbal language that hinted at unstable dangerousness, but one nicely tempered by the sturdy arms which, according to the advertising, gave the frames a 'masculine look." They wayfarer also ushered in the trend of glasses made of plastic and not wire or metal. After the 60's the sales of wayfarers declined and by 1980, with only 18,000 pairs sold, these classic shades were on the brink of extinction through discontinuation. Yet in 1982, Ray-Ban signed a $50,000-a-year deal with a company called Unique Product Placement to place the sunglasses in television and movies and between 1982 and 1987, Ray-Ban sunglasses appeared in over 60 movies and television shows per year. You might remember some of these movies, like Tom Cruise in Risky Business, Madonna in Desperately Seeking Susan, and television shows like Miami Vice. By 1983, sales of wayfarers skyrocketed to 360,000 pairs sold. If you remember the 80's then you remember these sunglasses and probably owned a pair. Yet, again, but the 1990's, wayfarers fell out of favor for styles like wraparound sunglasses and other styles. In 2001, the style underwent a redesign with frames that were less angular and smaller and were also made of lighter injected plastic. By the late 2000's the sunglasses made a full recovery and are now very popular again. To make the style trendy again using smart PR, edgy advertising and grass roots marketing efforts. Every year since the wayfarer has shown signs of steady growth with no signs of stopping. Are Wayfarers right for you? Find out here.